Come July 1, 2018, the NBA will rock as loud as possible because of one player: Lebron James. 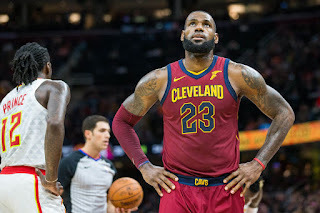 Even before the start of the ongoing season, LeBron's impending move to leave Cleveland for the second time has been one of the hottest and most talked about topics and given that the Cavaliers are struggling anew as they have stuck in 3rd place in the Eastern Conference with a 30-20 record, the possibility of him leaving again is inching closer and closer to reality and the only thing that could POSSIBLY stop LeBron from leaving is the Cavs winning an NBA championship possibly against the Golden State Warriors this June. And given the fact that the Warriors are ruling the NBA, again, like they did during the past three seasons, the Cavs' chances of winning the championship have become slimmer despite having LeBron James, Kevin Love who is injured again, Isaiah Thomas who hasn't played to his full potential this season, and Derrick Rose. And don't forget about Dwayne Wade. Now, out of the 6 teams that were mentioned, the Lakers are the only team that POSSIBLY missing the playoffs this season and yet they are the leading contenders to be the next team which LeBron James will be playing for- at least according to people who are close with the King. And with the Lakers appearing to be making the necessary moves to clear out as much as salary cap space to make them eligible to offer the maximum money for LeBron, Team LeBronZo (LeBron and Lonzo Ball) could be up in the making already. The Miami Heat, on the other hand, is one team which won 2 championships with LeBron James teaming up with Wade and Chris Bosh AND, Ray Allen. So it's no surprise that Miami is also considered probably because playing alongside Hassan Whiteside is hard to pass up. But will Pat Riley want LeBron James back? That's up for another debate. The Spurs are also a good possibility considering that they are now preparing for the post-Gregg Popovich era and with the possibility of Kawhi Leonard being traded soon, LeBron James to San Antonio could make sense. As they say, "If you can't beat 'em, join 'em," The LeBron James-to-GSW has been one of the hottest topics to bang up the league this week as it appears that the King is open to meet up with the defending champions. As it is right now, the Warriors are already loaded with talents so adding LeBron into the picture will kill the NBA in many ways. The only question is this: Who will the Warriors let go so that they can have the roster space and enough money? That's a tough question, right? The Rockets have a lot of tradeable players and a lot of talented players on top of their dynamic backcourt duo of Chris Paul and James Harden. If any miracle is to happen, Cleveland will be lucky to have LeBron James back next season as his current team is also included among the teams whose offers he will listen to. This will all depend on how good the Cavs are from this point on until July 1 and beyond. Which of the 6 teams will win LeBron's heart?